Forests play a prominent role in the global carbon cycle. Global forests contain over 60 per cent of the terrestrial above ground carbon and about 45 per cent of the terrestrial soil carbon (Dixon et al., 1993a; Dixon et al., 1994). Research on the role of forests in carbon recycling has become a priority since the Intergovernmental Panel on Climate Change (IPCC) assessment (1990), and because forests of Northern Eurasia constitute over 20 per cent of the global forest area, a number of projects have been undertaken to assess the amount of carbon storage and sequestration in these forests (Alekseev and Bridsey, 1994; Alexeyev et al., 1995; fsaev et al., 1993, 1995; Kolchugina et al, 1992; Krankina and Dixon, 1994). Scientists, working in the FSU, were among the first to emphasize the importance of boreal forests in carbon cycling (Gorshkov 1985, 1989). The major source of information for these projects was the forest inventory updated to January 1988. The results are based on an estimate of the territory covered by forests as 884 million ha (this includes both closed forests and other types of woodlands). Although there are inevitable discrepancies in results produced by differences in methodologies, in general, the estimates are consistent and show that the forests of Northern Eurasia store 29.5-50.4 petagrams of carbon (PgC) in living biomass, with the total average carbon pool in forest ecosystems of 71.6 Pg (Table 23.4). Russia's forests account for the largest proportion of the high latitude pool of carbon. In comparison with other high latitude (Alaska and Canada) and middle latitude (Continental United States and Europe) forests, they are characterized by high carbon densities (Table 23.5). The annual carbon sequestration rates are estimated at 0.06-0.49 Pg (Table 23.4), the forests of Eastern Siberia and the Far East being the major net sinks of carbon (Table 23.6). The carbon status of forests and the net carbon flux between forests and the atmosphere vary in time and space in response to both natural and anthropogenic factors. Thus, over the five years between 1988 and 1993, the total forested area in Russia expanded by 2.4 million ha while the area of closed forests was reduced by 7.6 million ha. The reduction in wood volume of 900 million m3 has resulted in a net loss of 0.5 Pg С from the living biomass carbon pool (Krankina et al., 1996). Natural variability occurs at the time scale of decades as a result of gradual changes in the ages of forests, species composition, site condition, and disturbance. Natural and human-induced hazards (e.g., forest fires, insect outbreaks, extreme weather) may convert large volumes of living biomass into plant detritus, the transfer being followed by a pulse of carbon release to the atmosphere (Kolchugina and Vinson, 1993; Krankina et al., 1996). Estimates of how much carbon is released as a result of forest fires vary. Assuming that postfire carbon release is 2.8 times greater than the direct emissions, Dixon and Krankina (1993) suggests that for 2.5 million ha of annually burnt forest, carbon emissions reach 0.28 Pg per year. Kolchugina and Vinson (1993) estimate that 0.199 Pg С is released annually, mostly in Eastern Siberia and the Far East (Table 23.6). Wood harvesting and changes in land use may generate rapid changes in carbon dynamics. Deforestation has been long known to be one of the major factors responsible for the accumulation of greenhouse gases in the atmosphere (Woodwell et al., 1978; Houghton and Woodwell, 1989). Estimates of net carbon flux, resulting from harvest and regrowth of forest, have shown that these two processes resulted in a release of 0.199 Pg С in 1975 (Shaver et al., 1982). Kolchugina and Vinson (1993) estimated that wood cutting accounted for an efflux of 0.152 Pg С in 1980. After forests are cut, carbon is released to the atmosphere from the decaying slash and wood products that are burnt. Thus it was estimated that in 1980, slash decay in the forests of the FSU released 0.205 Pg С to the atmosphere (Melillo et al., 1988). There is also a loss of carbon from forest soils following clear-cutting although the effects on carbon stock and time, required for the recovery from disturbance as forests regrow, vary (Melillo et al. (1988)). The effects of forest management practices are less well understood (Krankina et al., 1996). Some of these practices, such as the conversion of older forests to younger forests (Harmon et al, 1990; Dewar, 1991; Kershaw et al., 1993) and intensive management of forests (Krankina and Harmon, 1994), have been shown to increase carbon release into the atmosphere. Management of forests as carbon reservoirs has become an important component of broader environmental practices aimed at the protection of biological, soil, water, and air resources. It has been demonstrated by many projects that reduction in forest harvesting, skilful management of forest and agroforest systems, as well as restoration and management of degraded forest lands have potential for the conservation and sequestration of carbon (Dixon et al., 1993a, b). Can forests of Northern Eurasia be used and managed to mitigate climate change? Forests of Asiatic Russia are remote and still in a state of wilderness and for this reason any measures are difficult to apply at the scale of the biome. In more densely populated regions, however, improved management practices can contribute to increase of productivity of forests and conservation and sequestration of carbon. Shifting the emphasis of mitigation of climate change from management of the atmosphere to management of forests seems an attractive option although it is unlikely that it will curtail carbon dioxide concentrations substantially without any reduction in fossil fuel consumption. Direct reduction of carbon dioxide emissions is expensive while carbon sequestration through the improved forest management is cost-effective and more so in Russia than in other countries (Dixon et al., 1993a; Gusev and Korobova, 1997). There are two groups of practices aimed at the increase in sequestration of carbon: (I) maintenance and improvement of the existing sinks of carbon; and (II) expansion of forested areas (Dixon et al., 1993a, b). Krankina et al. (1996) have estimated that forest planting and expansion of the existing pools and sinks of carbon could sequester significant quantities (Table 23.7), although maximum sequestration rates may be expected only 30-50 years following planting due to the slow growth rate of boreal forests. Russia has a large potential to expand its forested area. It is estimated that 100 million ha may be available for forestation (Krankina et al. (1996)). Silvicultural treatments, such as thinning of stands and soil drainage, also produce a delayed effect. In contrast, fire management and harvest reduction provide immediate benefits being aimed at the prevention of carbon release rather than at the creation of additional carbon sinks. 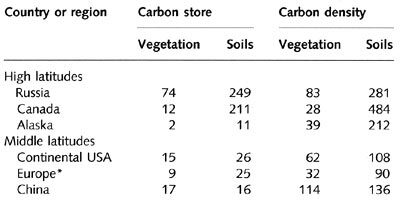 If all the measures listed in Table 23.7 are implemented, carbon storage in Russian forests can be increased over time by 2.02 Pg, which is an equivalent of Russia's net carbon emissions over a period of three years (Krankina et al., 1996). In addition to carbon sequestration, these measures help to protect soils and watersheds. A number of projects, aimed at the evaluation of opportunities and measures to offset carbon emissions through forest management, are under way in Russia. One such project is the Tenaska Saratov international project which seeks to establish 1400 ha of forest plantations in the Saratov oblast (Dixon et al., 1993a, b). A project, conducted in the Vologda oblast, is concerned with both carbon sequestration and emission-monitoring techniques, and the creation of an institutional and legislative framework for the implementation of carbon conservation measures in the future (Gusev and Korobova, 1997).